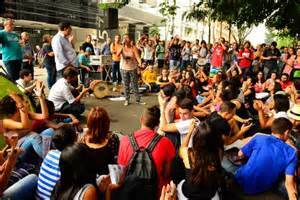 On November 9th, 2015, public school students in São Paulo State started a movement to occupy their schools protesting against the planned closure of around 94 schools, a measure proposed by the state governor Geraldo Alckmin. Since then the student activists’ movement has grown, with more than 200 schools currently occupied. Announced by the State’s Educational Administration in September, the government proposal would affect 311,000 students and their families ; and 74,000 teachers in 1,464 schools. According to São Paulo State Secretary of Education Herman Voorwald, the proposal is based on a number of studies and statistical data with the goal of improving the quality of education. The main idea is to reduce the complexity of school administration by separating schools into three levels : “Ensino Fundamental I” (ages 6 to 10), “Ensino Fundamental II” (ages 11 to 14) and “Ensino Medio” (ages 15 to 17). Starting on October 6th, students in São Paulo have been demonstrating in order to pressure the São Paulo educational administration into making the proposal’s details public. Protests intensified starting October 25th, when the educational administration announced the closure of 94 schools. The fate of these schools is unknown. On November 10th student activists occupied 2 schools, Fernão Dias Public School and Diadema Public School. The following day the educational administration announced their willingness to negotiate with student activists. However, negotiations failed when students didn’t accept the requirement that they leave the schools and go to the state administration building. Instead, they sought for government representatives to come to the schools to negotiate. Shortly afterwards, the government ordered military police to vacate the Fernão Dias Public School. However, a judicial order prevented that the police entered the school. According to the judge, the student activists’ occupation is a public policy issue and there is no threat that justifies police action. After these facts students from other schools in the state of São Paulo also occupied their schools and in three weeks are more than 200 schools occupied. Most of the occupied schools are in poor neighborhoods. In occupied schools, students are busy organizing alternative classes with volunteer teachers, lectures on various social issues, cultural activities and also maintenance work like cleaning the places. A great example of self-organization. The student activists have secured the support of parents, educators, journalists, lawyers and activists. All forms of dialogue and struggle were used like meetings with education leaders, petitions, marches and even brief occupations of public buildings. However, the government makes it clear that it is not open to negotiations on the “reorganisation” of the schools. These students resistance to the “reform” is spreading. Public schools will suffer even more if the state government manages to succeed in its plans. The students must put an end to the whole of the government plans, and the students are ready for the battle. Right now, more than 200 public schools are under the control of the students and yours demand is : end the “educational reorganisation” process ! Against the restructuring, lets occupy the schools ! For public and better education !